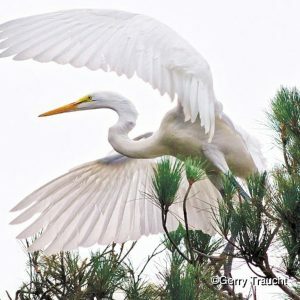 A Great Egret, a majestic white bird with a five-foot wingspan, takes to the air. One might imagine that this elegant large creature inhabits only exotic settings, but in fact this egret lives at the heart of the extremely urban San Francisco Bay Area. This bird belongs to an egret colony on Bay Farm Island off the southern tip of Alameda. 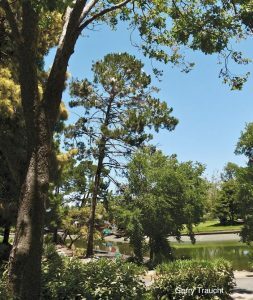 A Monterey pine leans over the lagoon on Bay Farm Island in Alameda, home to a San Francisco Bay Area egret breeding colony. 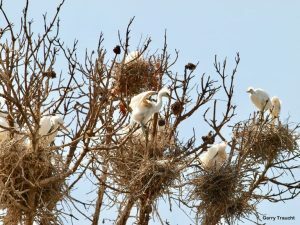 Nesting begins as early as February and continues through August. The egrets and the tree are almost hidden. 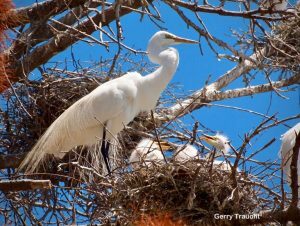 After the chicks are born and they begin to grow, the tree will resound with the rhythmic clacking of egrets. 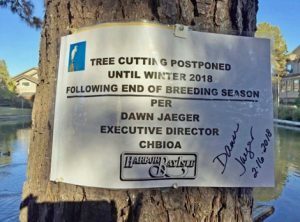 Due in large part to Golden Gate Audubon, the removal of a dying tree is postponed until after the egrets’ breeding season. 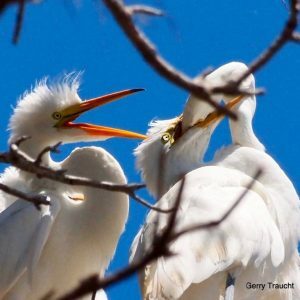 In March 2018, ten Great Egrets arrive. Soon they are joined by another four. 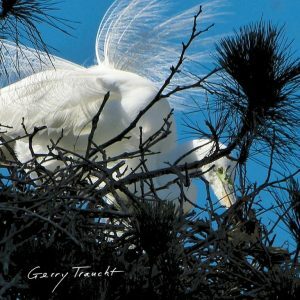 Two weeks later, a pair of Snowy Egrets arrive. By June the colony is noisy and full of life. But the tree is not as healthy as its inhabitants. 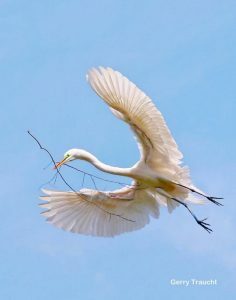 A Great Egret brings a gift of a branch to woo his mate and repair their nest. And then there are chicks! It is feeding time for the chicks. The parent’s bill and most of the head are inserted into the chick’s mouth and down the throat. Chicks build biting strength and coordination, as they nip the parent’s beak. 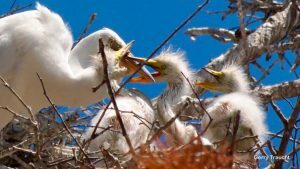 Fledgling egrets, now as large as their parents, experience quick changes between harmony and raucous battles in the nest. They are stretching their wings and learning to fly. New egret life abounds in the dying tree. By summer the pine’s green needles have disappeared leaving a clear view of the abundant breeding season. Now in September the egrets are gone. The Monterey pine is dead and scheduled for removal soon. 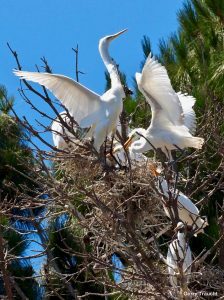 Next season the egrets will need a new tree. Once almost hunted into extinction for the value of their feathers – an ounce of feathers surpassed the value of an ounce of gold – these birds were saved by the landmark Migratory Bird Treaty Act passed in 1918. In celebration of the MBTA centenary, 2018 has been named the Year of the Bird. 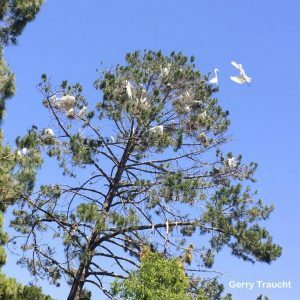 Instagram for current updates on the Alameda Egret Tree.